Highland township was first settled in 1855. Among the first arrivals were Michael Lee and his nephew, Miles McDonough. McDonough’s claim included the location of the first church and the present cemetery, while Lee’s claim included the site of the present church. Between 1856 and 1860, McDonough sold his claim to Timothy Ryan, whose residence hosted the first Catholic Masses. These were provided by Father Felix Tissot of St. Felix Church in Wabasha, who served Wabasha and Goodhue Counties. Mr. Ryan also donated five acres of his land to the new parish of Immaculate Conception, which was incorporated in 1861 as part of the Diocese of St. Paul. Local parishioners built their first church in 1866, southeast of the current church (i.e. across the road). It was a wood-frame building, twenty by twenty feet. Father James Trobec, who succeeded Father Tissot in Wabasha, enlarged it to thirty by thirty feet. 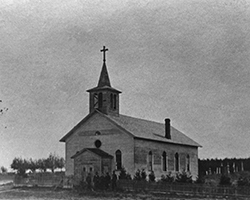 It was said that “a fine new building now occupies the site of this pioneer cathedral – a beautiful little white church with green blinds and a belfry.”In 1881 Conception was given its first resident pastor, Father Peter Jeran, who also served a mission parish at St. James Church in Oakwood. With a resident pastor came the need for a rectory. A two-story wood-frame building was built across the road from the church. In 1901 Father William Griffin became pastor. He oversaw construction of a new brick church at the site of the present church. Men of the parish hauled rock and supplies to the site with teams of horses. 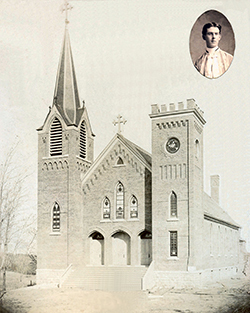 The new church was dedicated on October 28, 1903, by Bishop Joseph Cotter of Winona. In 1919 a new rectory was completed. Today it remains in use for meetings and faith formation. On July 2, 1922, fire gutted the church when lightning struck the bell tower. After the walls were judged safe for re-use, reconstruction commenced, including new pillars in the church and basement for added stability. The new structure was completed in 1923. 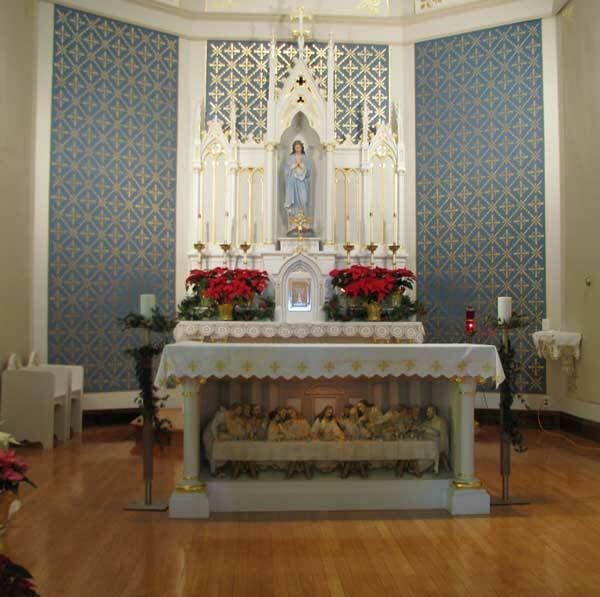 The church gave rise to a tiny rural settlement which is now much diminished, but is still known as Conception. It included a public elementary school until 1971, and even a small postal station. 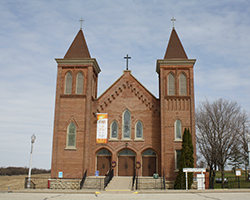 St. Joseph’s Church in Theilman was clustered with Conception from 1909 to 1988; but since 1983, Conception has been served by priests resident in Plainview, Kellogg, or Wabasha. Today it is clustered with St. Joachim Parish in Plainview.